Powered by a 2.5-liter 4-cylinder or an optional V6, the Nissan Altima features handsome styling and a spacious interior, and is one of the sportiest entries in its class. 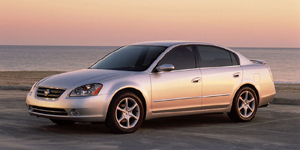 The Nissan Altima is completely redesigned for the 2002 model year. Larger than its predecessor in every dimension, the Altima features handsome styling, a spacious interior, and responsive handling. Available for the first time is an optional V6 that turns the Altima into the most powerful car in its class. The 2002 Nissan Altima Sedan is powered by a base 2.5-liter Inline-4 with 175 hp. Also available is a 3.5-liter V6 with 240 hp. Find the used Nissan Altima of your choice from a dealer in your area. Search our used car listings now.